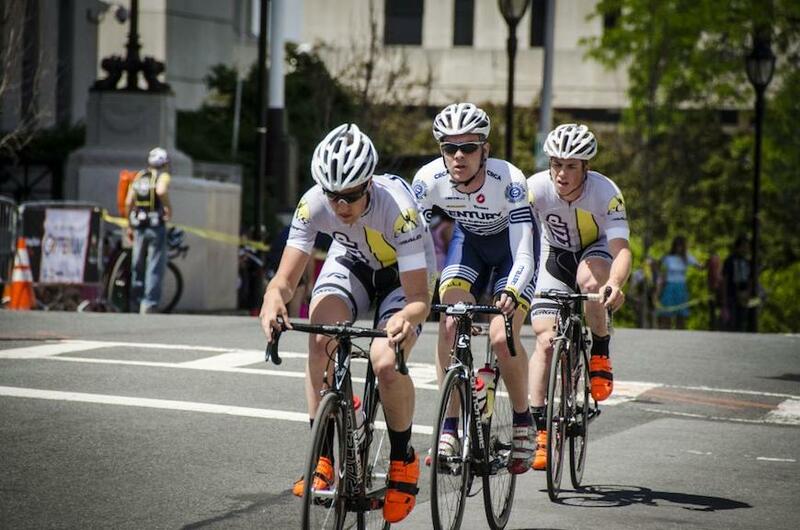 The CCAP participated in one of Connecticut’s most prestigious races this past weekend, the Keith Berger Memorial Criterium. This classic, flat four corner crit in East Hartford, CT is a sprinters dream and begs breakaway riders to give it everything they have. The CCAP Pro-am and Junior Travel Teams lined up together with the goal of forcing an early breakaway and sprinting from that small group for the win. This tactic worked a few years ago when, now veteran CCAP rider, Ron Larose took the win. Pro–am team members John Harris and Connor Walsh worked well together and kept the race on its toes from the start whistle. Unfortunately disaster struck for Harris at the mid-point of the race when he was involved in a crash! Harris re-entered the race on a pit bike and resumed racing as the point man for CCAP Junior Travel Team sprinting ace, Ian Whaley.